The increasing number of gesture-control technologies being introduced these days means that a time may actually come when you can control your whole house with just the wave of a hand. Hot on the heels of the MYO armband that lets you control Macs and PCs through gesture is the “Airwriting” glove – a glove that gives you the power to compose emails and text messages by writing on, you guessed it, air. The glove, developed by researchers from the Karlsruher Institut für Technologie in Germany, contains sensors that record hand movements. A computer system captures and decodes those movements. It has the capacity to differentiate between gestures meant to spell words and random, unrelated gestures, so you can wear the glove just fine and airwrite whenever you like while doing something else. 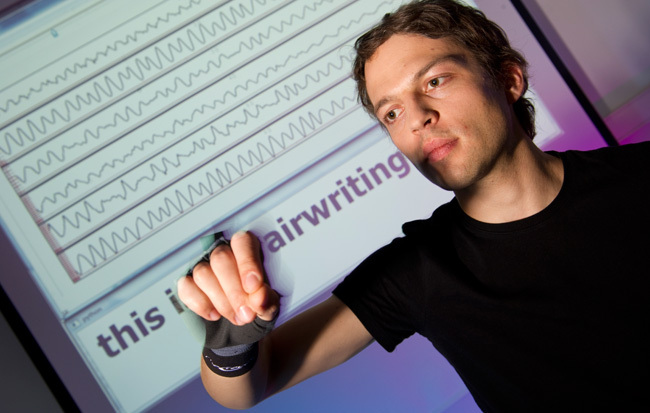 “All movements that are not similar to writing, such as cooking, doing laundry, waving to someone, are ignored,” Doctorate student Christoph Amma, one of the developers, said on airwriter’s press release. “The system runs in the background without interpreting every movement as computer input.”Amma believes that the technology could eventually be incorporated into clothing – like a wristband – for everyday use. The system currently recognizes capitalized letters and has a total vocabulary of 8,000 words. But, since the glove is just a prototype, it’s nowhere near perfect. It has an 11 percent error rate that goes down to 3 percent the more you use it and the more the system gets used your movements. Amma and fellow developer Professor Tanja Schultz recently received the Google Faculty Research Award worth $81,000, meant to be used to develop the technology for mobile devices, which means that in the future, America’s fastest texter could also be the the nation’s best charades player.